- Now, that's a very unique concept! - Too much based on a too small keyboard concept. Apart from this concept, nothing (software, design...) is really appealing actually! There's quite al ot to say about this very unique watch! I'll start with the display! Usual digital watches feature a 8-bar digit display, i've even seen bar alphanumeric displays on some old databanks; some other watches include a graphical pixel area, and some other even have a whole pixel graphical screen. Well, this watch here has a *character display*! The display area is made of 40 5x7 pixel characters, with a white line separating each characters. Despite this "non graphical" display, the software frequently uses several characters to display larger graphic elements. The time, for instance, uses 2 characters big digits, that appear with a white line in the middle! Another graphic use of the display is the bank switching screen, where a giant A or B is displayed using 4x4 characters. Now, the main originality is not this character screen, but the separate keyboard! With it's 2KB memory, the watch in itself only allows browsing the memory content, along with standard watch features (timekeeping, stopwatch, alarms). When linked to the keyboard, data editing is available, and a calculator mode is added. The basic idea is pretty good, since data entry has always been the weak point of every small-sized data management units. Now, it would have a better dimension if either one of the two memory banks was available as a pre-formatted data manager, such as a contact list. As is, the only way to keep a sorted list of phone numbers is to input the whole sorted list in the correct order, which excludes sorting future additions to the list. Seiko adapted this concept to a number of other watch-based systems. 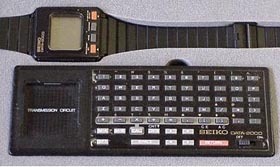 The UC-2000, for instance, uses a similar watch coupled to a 8-bit BASIC programmable keyboard! The induction circuit and communication protocol are fully compatible between DATA-2000 and UC-2000; it seems that the only difference between the "DATA" system and the "UC" system lies in the casing and marketting. RAM : 2 KB ROM : ? ?